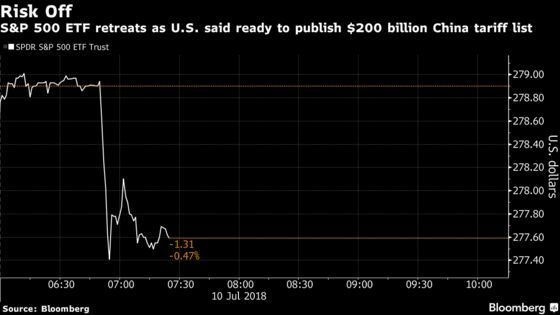 (Bloomberg) -- U.S. equity futures erased gains after it was revealed that the Trump administration is preparing a list of more Chinese goods to be hit with tariffs. The yen erased losses. Stocks had climbed in the regular trading session Tuesday and Treasuries fell as a lull in the trade war gave investors room to focus on the start of earnings season. That promptly changed as Bloomberg reported that the list could be released as soon as Tuesday, and likely this week, according to the people, who spoke on condition of anonymity because the matter isn’t public. Earlier, the S&P 500 Index closed higher for a fourth day, the longest streak since the beginning of June. PepsiCo Inc. jumped more than 4 percent after reporting better-than-forecast profit, while banks fell ahead of JPMorgan Chase & Co. and Citigroup Inc. results Friday. The Russell 2000 Index declined, ending a five-day rally. The dollar reversed earlier gains as the euro pared losses. Treasury yields advanced for a second session and West Texas crude held at around $74 a barrel. Investors are turning their attention to earnings season in the hope that strong results can complement a recent run of positive economic data. Elsewhere, a basket of emerging-market currencies gained, while Turkey’s lira climbed after yesterday’s end-of-day tumble as traders came to terms with President Recep Tayyip Erdogan latest power grab. Earnings season gets going with JPMorgan and Citigroup among the largest companies due to give results, as well as India’s Infosys Ltd. The most noteworthy U.S. data may be the June inflation report on Thursday, which consensus expects will show both headline and core price growth picking up. There’s another deluge of Treasury debt sales too, with a total $156 billion of notes and bills offered. Chinese trade data due at the end of the week will probably show slightly slower export growth, after early indicators pointed to softer overseas demand and weaker export orders, Bloomberg Economics said. Futures on the S&P 500 erased gains and an exchange-traded fund tracking the gauge slipped 0.5 percent in after-hours trading. The S&P 500 Index earlier closed 0.4 percent higher. The MSCI All-Country World Index fell 0.1 percent. The MSCI Emerging Market Index advanced less than 0.1 percent. The Bloomberg Dollar Spot Index dropped 0.1 percent. The euro fell 0.1 percent to $1.1745. The British pound rose 0.1 percent to $1.3270. The Japanese yen was flat after sinking 0.4 percent to 110.98 per dollar. The yield on 10-year Treasuries dropped one basis point to 2.849 percent. Germany’s 10-year yield gained two basis points to 0.32 percent. Britain’s 10-year yield advanced five basis points to 1.302 percent. The Bloomberg Commodity Index fell 0.4 percent. West Texas Intermediate crude rose 0.5 percent to $74.21 a barrel. Gold was little changed at $1,255.58 an ounce.